Up to this point we have been describing the functional parts and modifications of gear couplings. Another attribute that needs to be described is the performance parameters of the unit. Those parameters include two most important items and many more secondary items. (The HercuFlex & Sier-Bath gear coupling product pages & downloadable PDF catalogs are the best place to find this information.) The important items are the bore and torque capabilities in that order. The secondary items can include a whole host of things like speed, misalignment, weight spacer length, inertia, etc. Torque in this case refers to normal operating torque that the coupling must transmit. Bore refers to the nominal shaft size where the coupling will be used. The gear coupling selection in most cases will be determined by the nominal shaft size. If it fits it is okay. The second sort would be to check the torque requirement of the application versus the torque rating of the coupling. Normal operating torque is used unless a peak or cyclic torque is known. The application description is also important to see if further investigation is needed. Smooth running 1800 RPM machinery without high torque starting or stopping requirements can be selected with bore size. If the application calls for peak torque or cyclic torque, more care must be taken. The normal or continuous operating torque is that torque value that is required for the design point operation of the machine on a continuous basis. The every day operating point if you will. Torque can be derived from the required horsepower at the operational speed. Coupling ratings are sometimes listed as HP per 100 RPM. Torque and horsepower can be derived from one another if the speed in RPM is also known. The equations for that can be found in the coupling catalog. Service factors are applied to the normal torque to account for application variations. The variations can take many forms, but they are usually application specific. Service factors allow selection on of a coupling for torque and perhaps life without going into the details of the situation. While a bore is finite, torque can be many different values. For application factors one can refer to the Lovejoy gear coupling section of the catalog or any other gear coupling catalog. Service Factors are based on empirical data and experience. Safety Factors and Service Factors should not be interchanged or confused with each other. The former is for design work and the latter is for applications work. The method is multiply the normal or continuous application torque by the service factor to obtain the coupling selection torque. Normal torque and continuous torque are synonymous in this procedure. The torque developed by the motor may exceed the normal torque of the application, but should seldom exceed the coupling selection torque. It is also acceptable to select the coupling by applying a service factor to the motor nameplate horsepower converted to torque. The selection torque obtained this way can often result in oversize couplings. Sometimes gear couplings are deliberately oversized to extend the tooth life. Other complications may result from doing that. Normal or continuous torque was defined in the previous paragraphs. The torque forces we are describing are those necessary to operate the machinery successfully. They may also be used to size the motor or driver. Peak torque can occur under several circumstances, but are usually transitory conditions. A typical peak could occur on starting if high inertia loads must be started, another might occur if an emergency stop happens, or blockage of the machinery occurs, or voltage spikes, or torsional resonance. Peak torque is usually accounted for by limiting the peak cycles to prevent low cycle fatigue in the coupling. Cyclic torque on the other hand could occur continuously for the life of the coupling. It might be that the application operates under a "cycle" of load and unload or it might be that start and stop is a routine of the application. The start and stop routine means low starting torque and non-emergency stops. They might be classified as slow and smooth. Cyclic loads are accounted for either in the service factor or in the coupling torque selection. Service or application factors are established to account for these torque variations based on past experience. If exact values are known they could be used to directly select the coupling. The subject is included to highlight the fact that it is not recommended. That is do not exceed the bore associated with the coupling size and the key type. That means square keys have a maximum bore rectangular keys have another and metric has its own. Do not mix them. In general, the shaft to hub connection can be the weak point of the coupling. When extra shrink is requested, engineering should review the application. If an overbore is requested for low torque applications, engineering must check the application. 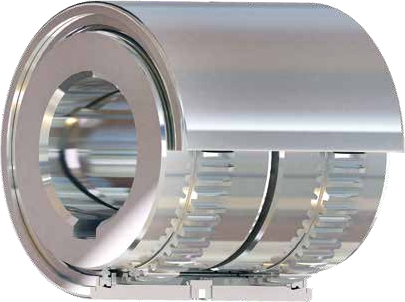 The gear coupling is the smallest most power intensive coupling as it is designed. Stretching the limits can result in machinery failure as well as coupling failure. We mentioned that high speed units need to be balanced to reduce vibration and subsequent damage to the connected machinery. Catalog ratings are often accompanied by speed limits in RPM. In the case of this coupling parameter it is possible to increase the value by balancing the coupling. That is mentioned in the catalog with the rating value. Balancing combined with special manufacturing tolerances can increase the speed even more. Even a perfectly balanced coupling will eventually have a speed limit. That limit comes from stress, friction between the teeth, and lubricant breakdown. All couplings have a misalignment limit. That limit will vary by the coupling style and can also vary by modification to a standard product. The gear coupling is generally capable of 1 1/2 ° of misalignment per mesh. Special gear couplings can exceed that. The limit can go to 6° or more, however, a special design is required as is engineering involvement. High misalignment limits can reduce the torque capability of the coupling. High misalignment of some types are limited to non-operational conditions. Special couplings, many of which have been mentioned in this blog require engineering or manufacturing involvement before the selection or pricing is possible. When contacting Lovejoy engineering, it is advisable that as much information about the system and application be gathered in advance so that Lovejoy can quickly facilitate coupling selection for you. Steel can be treated in many ways to improve hardness and strength. The hardness is the key to longer life under conditions like high speed or heavy loads. Strength may be the requirement of couplings that have cyclic loads or have impact loads. Each application is reviewed on its own merits. There is no direct relationship that allows the coupling to be re-rated for a material change. Both bar stock and forging have the same strength characteristics and would hit the same basic specification. Cast steel couplings would have their own capabilities that are different and likely lower than bar or forging. Couplings that are designated as stock units are the competitive coupling sizes from 1 to 15 for which we keep sufficient stock to supply most orders. Stock is based on forecast usage and updated regularly. While larger OEM type orders may require raw material sourcing and longer lead times, smaller MRO type order can generally be supplied from stock and are largely available for Quick Ship finishing if not. These units are often made from stocked components. The component stock may include both RSB hubs and partially machined parts and raw forgings ready to go to final machining once it is determined what final result is required. In this category are special bore and keyway requirements, metric bore requirements, hubs that are faced or counter bored, hubs that require clearance fits, some mill motor or taper bore hubs, and add on pieces like limited end float or vertical plates. Non-standard spacer lengths for smaller sized gear couplings are made from stock raw material. Short sliders can be made by facing hubs and making long tooth, standard length sleeves. Major modification couplings are a combination of standard parts, modified parts, special standardized parts and designed to order parts. Included with those designs are floating shafts, insulated couplings, long sliders or Jordan couplings, cutout couplings of two types, shear pin couplings, brake wheel couplings, and moderate speed units where careful machining and component balance will suffice.